Although currently limited, research suggests that these microorganisms may help prevent and manage gastrointestinal troubles in youngsters. It’s not the stuff of horror movies but a fact of nature: Your gut is crawling with bugs. But don’t despair. These bugs are small and if you’re healthy, most of them are friendly. The bugs we’re talking about are the millions of bacteria that colonize the human gastrointestinal (GI) tract beginning with an infant’s journey down the birth canal. This collection of microflora, comprised of a number of bacterial strains, changes over the life span due to alterations in diet, exposure to pathogens, and age-related changes in GI functioning. The number and strength of beneficial bacteria vs. potentially harmful bacteria can impact many aspects of human health. Significant evidence indicates that a preponderance of friendly microflora plays an important role in nutrition, digestion, and immunity. A healthy bacterial balance may help ward off a number of conditions that manifest in the intestines and some conditions that affect distant organs. 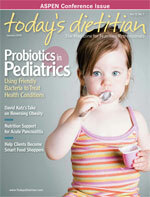 Studies have shown that probiotics may benefit not only adults but also infants and children. By analyzing the available evidence, dietitians can provide parents with appropriate guidance on probiotic use in children. For most conditions, probiotic research is limited. However, research on probiotics is expanding at a rapid pace, and many preventive and therapeutic uses will likely emerge over the next several years. Common foods containing probiotics include fermented and unfermented milk, miso, tempeh, and some juices, smoothies, nutrition bars, and soy drinks. The most common strains found in yogurt are L. bulgaricus and S. thermophilus. Yogurts labeled as having “live active cultures” must have 100 million live active bacteria per gram. How do probiotics protect the body against disease? The favorable bacteria in the gut constantly defend the body against foreign microbes that, when left unchecked, may lead to illness. Current evidence suggests that helping the gut’s fleet of good bacteria grow and thrive by ingesting probiotics can help humans defend their health in a number of ways, not all of which are fully understood. For years, parents have independently administered probiotics, especially yogurt, to their children to prevent and treat mild conditions such as diarrhea. In recent years, the alternative and mainstream medical communities have become increasingly interested in and supportive of particular probiotics and some prebiotics to prevent and treat a number of other, often more complex conditions. The use of probiotics in pediatrics has tripled in the past five years.1 Clearly there is a demand for affordable, accessible alternatives to traditional pharmaceuticals for a number of pediatric conditions. However, the effects of most probiotics and some prebiotics have not been thoroughly studied in children. Using probiotics and prebiotics, creating what are called synbiotics, is another potential therapy since the prebiotics nourish and fortify the probiotics to survive the upper GI tract. However, there is also little evidence on the safety and effectiveness of this type of combined use in clinical practice. For safety reasons, dietitians and other health practitioners should caution patients who self-treat with probiotics in supplement form that extended use or unsupervised use may not be entirely safe. Individuals should divulge use of probiotics, like use of other types of complementary and alternative medicines, to their physician. Overall, probiotics seem to have a bright future in dietetics and in general medicine, as research in this area continues at a quick and enthusiastic pace. The number of conditions that may respond to probiotics is expanding. Conditions under study include vaginitis and vaginosis, periodontal disease, respiratory and skin infections, growth problems, genetic mutation, and even obesity. Given the wide range of potential therapeutic and preventive possibilities, discoveries in probiotics and prebiotics will offer dietitians, physicians, and individuals a number of new options for curbing GI conditions and perhaps ways to preserve the health of organs throughout the body. 1. Wallace B. Clinical use of probiotics in the pediatric population. Nutr Clin Pract. 2009;24(1):50-59. 2. Hasler CM, Brown AC; American Dietetic Association. Position of the American Dietetic Association: Functional foods. J Am Diet Assoc. 2009;109(4):735-746. 3. Young RJ, Huffman S. Probiotic use in children. J Pediatr Health Care. 2003;17(6):277-283. 4. Roberfroid MB. Prebiotics and probiotics: Are they functional foods? Am J Clin Nutr. 2000;71(6 Suppl):1682S-1687S. 5. Floch MH, Walker WA, Guandalini S, et al. Recommendations for probiotic use—2008. J Clin Gastroenterol. 2008;42 Suppl 2:S104-S108. 6. Douaud C. Probiotics play increasing role in pediatric research. May 25, 2007. Available at: http://www.nutraingredients-usa.com/content/view/print/180150. Last accessed October 29, 2009.